Built for professional lobster hunters, the MAKO Spearguns Heavy Duty, Stainless Steel, Lobster Noose is unlike any other Lobster Noose available in the USA. It features an all stainless steel tubing construction for unmatched strength and durability. Additionally, the noose itself is made of 100% stainless steel cable instead of monofilament cord that can rot and break. THIS IS THE ONLY SPRING LOADED LOBSTER NOOSE WITH STAINLESS STEEL CABLE!!! The same lobster noose is used by commercial lobster hunters in Australia, South Africa and New Zealand. And now, MAKO Spearguns is proud to make this noose available here in the USA. 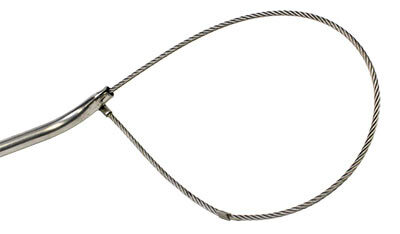 The spring loaded noose is a one hand operation with lightning fast closure. This is a heavy duty robust lobster noose that will contract down to 41" for easy travel. The lobster noose is so heavy duty that if you drop them, the current will not take them away like the plastic type nooses. And, because we sell direct to you, the diver, you can get this heavy duty, all stainless steel noose (including stainless steel cable) for about the same price as a plastic noose. This is not your typical lobster tool like the ones made for recreational use. This is a heavy duty lobster tool made specifically for commercial Lobster divers in New Zealand, Australia and South Africa. You will be amazed with the quality and durability of this commercially used tool. PLEASE NOTE: It is illegal to use the Lobster Noose in California waters. Used the lobster snare / noose soon after received it worked well. Some suggestion I have are; maybe it could be 4-6Ã¢â‚¬Â shorter and or at least some type of mechanism to keep it retracted making it easier to clip on bcd and carry. I used a fin heel strap wire tied to the shaft forming a loop over the knob . used this noose for the recent mini season in the keys and although it works great for getting them out the rocks they wiggle their way out in a matter of seconds. Like no other noose I've seen/used on the market. Great design and very well-made. A bit lengthy/bulky, but great if you've got room!